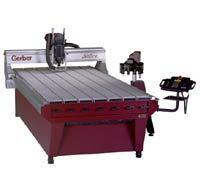 Our Saber 404 CNC (Computer Numerical Control) router is ideally suited for dimensional or architectural sign making. The router accomplishes digitally designed letter and graphic routing in both 2D and 3D formats, using many different indoor or outdoor materials - such as wood, high-density urethane (HDU) foam, PVC, acrylic, decorator aluminum and many more. The capacity of our Saber 404 is 54” wide x 4.4” high x 120” long with pull-through software capability. We run our router using Gerber Omega ArtPath cutting software and can import designs from many common CAD platforms. Creativity is the name of the game when using the router. Projects can include but are not limited to push-through letters, engraving, drilling, reverse carving, prismatic letters, V-carved letters and graphics. Whether we are producing a building sign, monument sign, parts fabrication or desktop edge-lit display we can incorporate multiple materials and methods to make every design a masterpiece. We provide custom cut and carved signs, prototype production parts, short run fabrication parts, plastic or acrylic fabrication, wholesale components and many other custom solutions.